That was a direct quote from me 19 years ago when I first rode past Ellis Park during the Winterland Light Show. My parents were on the receiving end of my begging and happily wanted to see what all of the lights in the park were, too. What&apos;s unique about this memory is that I didn&apos;t live in the area at the time. Back then, I lived in a town in Illinois that sits on U.S. 36. So anytime we went to the zoo or picked up a family member from the airport, we used 36 and drove through Danville. And every December this included a trip to the Winterland Light Show. One year I remember picking up my grandmother at the airport for Christmas then driving through the light show with her, my mom and my two brothers. The display of people fishing was my favorite. I was completely intrigued by how they were able to make it look like they were catching the fish and pulling them out of the &apos;water&apos;. As the years go by, technology makes the displays even more fascinating. Songs and lights are synced together on giant trees and this year a selfie station is set up to upload to the event Facebook page for prizes. I appreciate the combinations of traditional and new and am happy to report the fishing display is still there! I took my family Sunday night to this year&apos;s display, and instantly heard "Wooooow" from my 3 year old. My 5 year old wants me to tell you that the horses running with the carriage is her favorite. Whenever my parents or my nieces and nephews visit, we grab our hot cocoa and coffee and head to Ellis Park. It is how I am able to solidify my &apos;cool aunt&apos; status. The light show never disappoints as we drive around listening to holiday music and seeing a different display every 50 feet or so. 500,000 - Approximate number of lights in the park. If you lined them up end to end they would stretch almost 8 miles. $7,000 - How many dollars it takes to change out 3 displays to LED lights. There is a plan to eventually change them all, but at this cost they have be done a few at a time. 1,600 - Number of hours it takes for Park and Recreation employees to set up the display and take it down every year. $8 - Entrance fee per car. 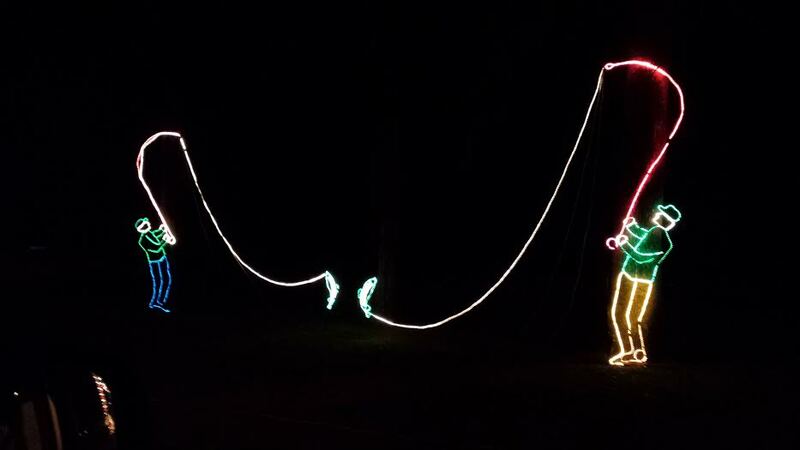 The Winterland Light Show Facebook page and Danville Chamber of Commerce website has coupons for $3 off. Simply print off or show on your phone upon entry. Santa visits the park inside the train station building on Fridays and Saturdays from 6-10 p.m. and also Sundays from 6-9 p.m. It is only $5 to get your picture taken with him, and you can take pictures yourself, too. This is organized by the Business Professionals of America (BPA) students at Danville Community High School. The smiling greeters at the gate spreading holiday cheer are volunteers from different organizations from the community and chamber members. We had a wonderful group from the Danville Junior Honor Society that gave us candy canes and special glasses to see the lights. You get to drive the route as many times as you like, but if you leave the park that is it! 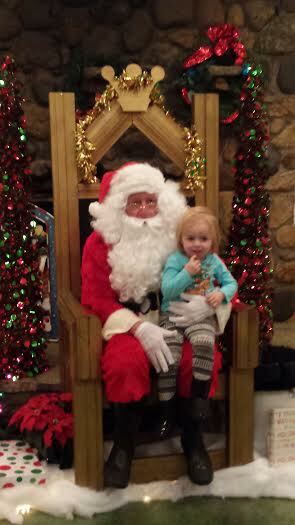 If you don&apos;t want to see Santa, I recommend going during the week when it is less crowded. But even when it is, it is fun to take your time and enjoy the event with your family. The light display runs now through Dec. 30. Hours are 6-9 p.m. Sunday through Thursday and 6-10 p.m. Fridays and Saturdays. Now pile up that car and go make some memories! * A HUGE thank you to Will Lacey for taking time out on a Sunday to help me give you the inside scoop on this year&apos;s Winterland Light Show!